Helloooooo South Island!!! Yesterday, after a very rough 3 hour ferry ride across the rocky waters of the Cook Strait and an hour winding along the Queen Charlotte Road with gorgeous views of the Marlborough Sounds (only photos taken with the mind’s eye since I was driving), we arrived in the small town of Havelock for lunch. 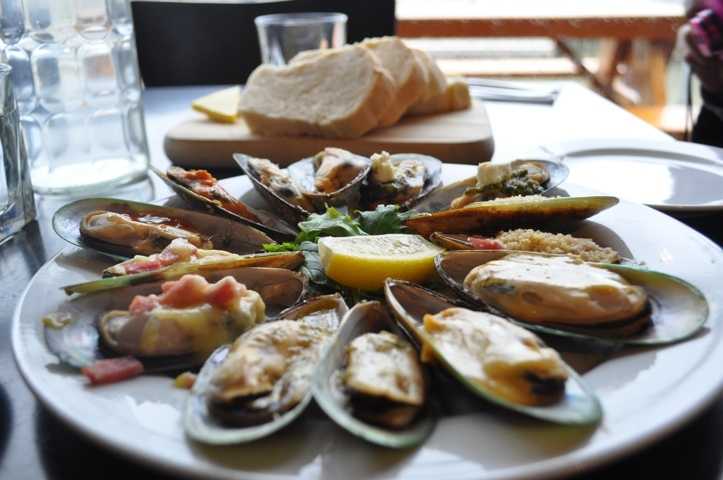 Havelock is known for their green-shelled mussels and, despite our slightly nauseous state from the above, we thoroughly enjoyed them. After that, we took at brief 1/2 hour drive to the little town of Renwick, right in the heart of the Marlborough wine country. We arrived just in time to visit 2 wineries that were within walking distance: Mahi, which had a really good Pinot Noir, and the Gibson Bridge Wines – a small family owned (the owner poured our wines) 6 acre winery specializing in Pinot Gris and Gewürztraminer (thankfully auto-fill on my iPad works for that word). A great way to start off our wine tasting adventure. Cloudy Bay Vineyards – Their Te Koko wine (a variation on a Sauvignon Blanc) was amazing! Drylands Winery – Actually owned by Americans (the nerve! ), this winery produces several lines of wines, all surprisingly good (Nobilo Icon, Kim Crawford, People’s) despite being corporate owned. Wither Hills – A winery with a beautiful view and a nice reasonably priced Sauvignon Blanc. Grove Mill – With a very nice, complex Riesling. 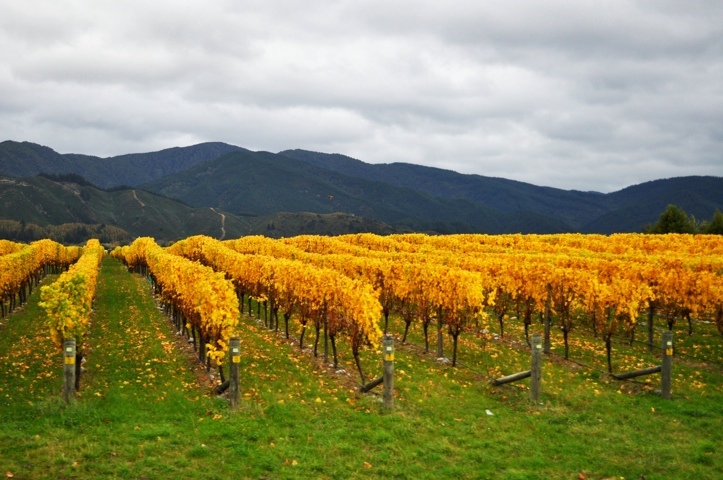 -Marlborough mainly specializes in white wines – Sauvignon Blanc, Gewürztraminer, Riesling and Chardonnay. They also do Pinot Noirs, though I found that it tended to be on the lighter side, and more fruity. -Most of the vines grow on flat land, which usually to be covered by the river. Under the surface, the roots dig deep into smooth river rocks, which give the wines their minerality. 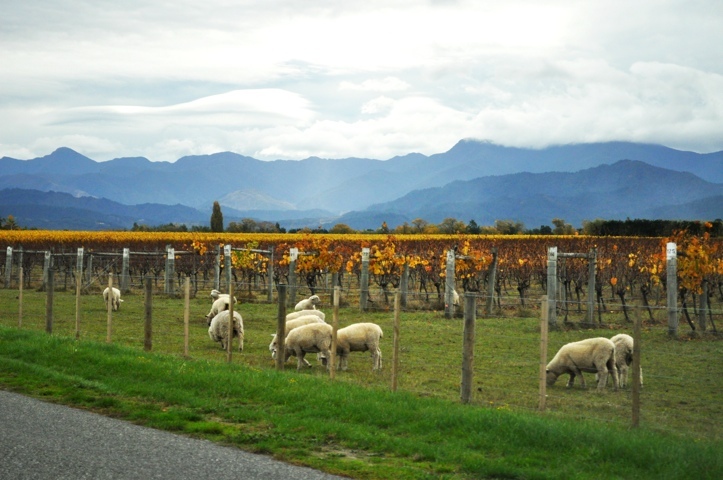 You don’t see this in California – Sheep among the vines! Gorgeous pictures that you would find in a magazine! Great job taking those photos. Was talking to my manager about NZ, said he travelled there and after touring the sheep farm, he could not eat lamb ever again. He said they were so cute and to think they are slaughtered at a tender young age just couldn’t sit well in his stomach. So, I told him I better not go to NZ either or else I’ll never eat Costco lamb chops ever again! And that I couldn’t do…not until the New System.